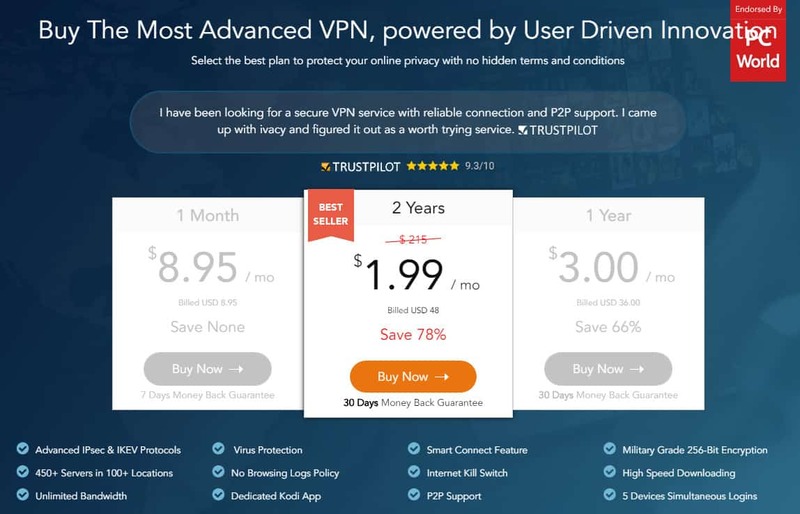 Ivacy VPN review 2019 | Is this Cheap VPN too Good to be True? Ivacy is an affordable and secure option for those looking to unblock streaming sites like Netflix and is a solid choice for torrenters too. Singapore-based Ivacy is definitely not new to the ranks having been around since 2006. This provider has a relatively small network but is a fierce competitor when it comes to price. 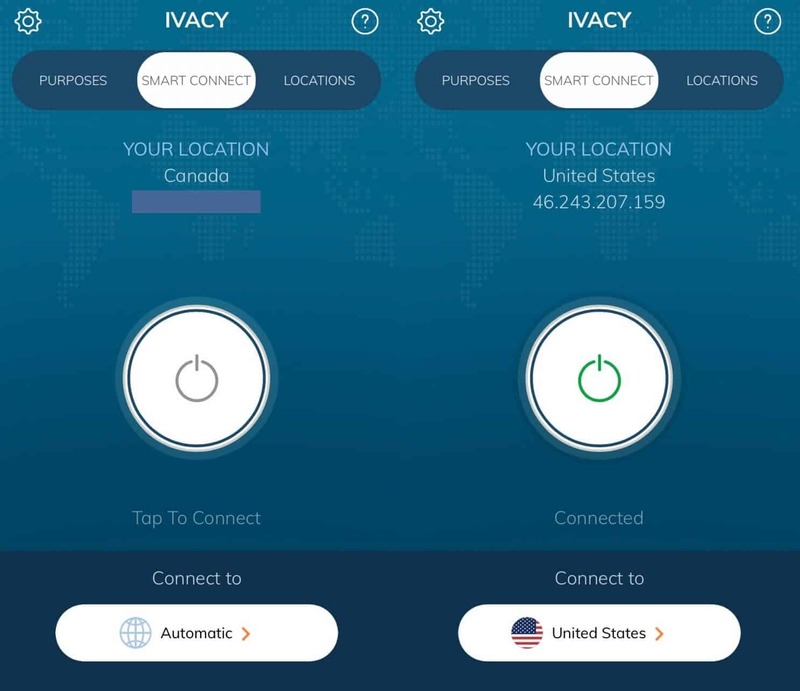 Claiming to be “the most advanced VPN,” Ivacy has a relatively small user base of over 200,000 across the globe. We’ve taken it for a test run to see how it stacks up against the competition. Ivacy offers a single package with three different pricing plans, dependent on the length of term you sign up for. A monthly plan will cost you $8.95 per month which is about average for a solid service. However, sign up for a longer term and you’ll see steep discounts. The price of a one-year term works out to $3 per month and a two-year term is only $1.99 per month. If you sign up for a five-year plan, it’s a mere $1 per month. Ivacy also offers a 30 days money-back guarantee. To sign up, you have plenty of payment options, including PayPal, major credit cards, Bitpay, Alipay, as well as various coin payment and fiat payment platforms. The multiple options for paying with bitcoin and other cryptocurrencies will please privacy-conscious users. Ivacy apps are available for Windows, MacOS, Android, and iOS. The VPN can be set up manually on Linux and some routers. With each plan, you can connect up to five devices simultaneously, which is pretty much the industry standard and ample for most users. An Ivacy account gives you access to over 450 servers covering more than 50 countries. These include some P2P-optimized servers in various countries, including the US and Canada. You get unlimited bandwidth for downloading and uploading as much as you want, making this ideal for torrenters. Kodi users might also be drawn to this provider as it has a dedicated add-on to mask your IP while using the service. Security perks include 256- bit AES encryption, built-in IPv6 and DNS leak protection, and a kill switch. You can choose from multiple protocols depending on your needs, and take advantage of app-based split tunneling that enables you to choose which traffic goes through the VPN. Once you’re set up with an account, downloading and installing the apps is simple. For the purposes of this review, we’re using the Windows and iOS apps. After you log into the client, you’ll arrive at a sleek, modern-looking main screen. Here you have a server dropdown that you can set to display countries or cities. Once you’ve selected your server, you’ll see your new IP and the amount of time you’ve been connected to the VPN for your current session. Using the left navigation pane to switch screens, the next three options are Secure Download, Streaming, and Unblocking, respectively. In each of these screens you can select the country you want to connect through. 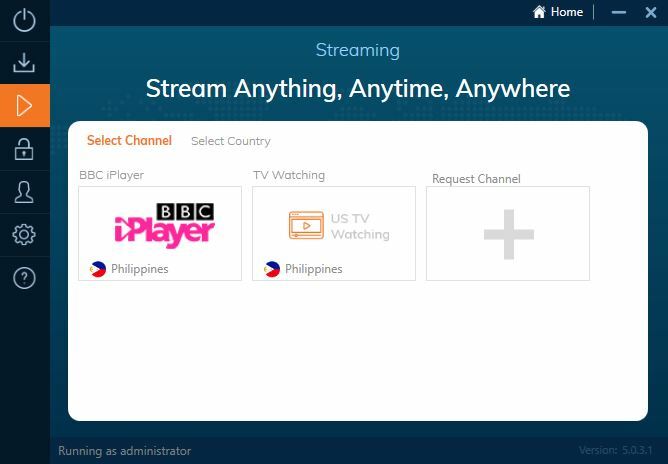 In the case of streaming, you can alternatively select the channel you wish to watch. You’ll then automatically be directed to the server that best fits your needs, be it downloading, streaming, or unblocking. Next on the navigation bar is an option to view your account info, followed by the Settings screen. Here you’ll find two tabs, General and Connection. In the first, you’ll see startup options along with IPv6 leak protection. Note that the latter is disabled by default. 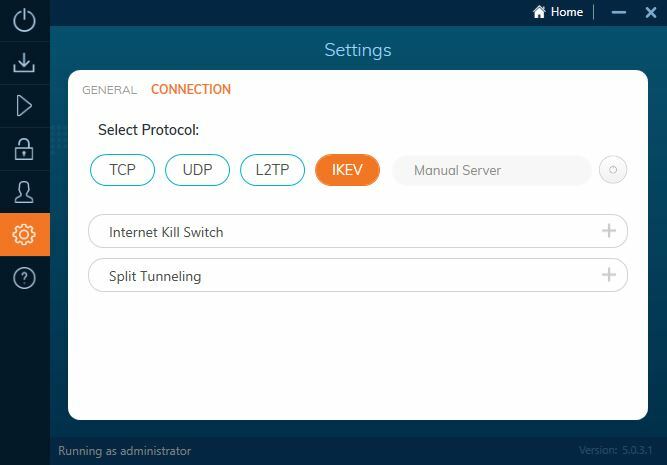 In the Connection tab, you can select your protocol, manually enter a server, turn on the kill switch, and select split tunneling. Overall, this is a well-designed and intuitive app that won’t be off-putting for beginners but provides enough options for those with more specific needs. Over in the mobile app, you’ll find an equally intuitive interface with a clean, modern aesthetic. The main screen will take you straight to the Smart Connect option. 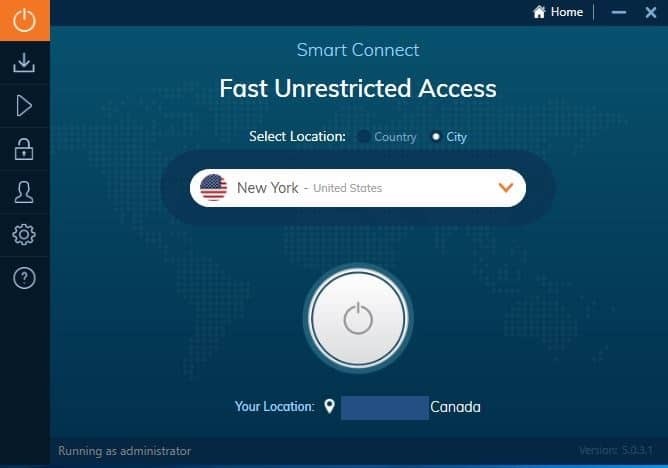 By default, the US is selected as the country, so if you simply click the power button, you’ll be connected to the fastest available US server. Here, you can see your current location and IP address. At the bottom of the screen is the Connect to option, which takes you to the country list. You can opt to view cities instead by selecting the Cities tab. These lists are also accessible by selecting the Locations tab near the top right of the app. Once you’ve chosen your location, you’ll automatically be connected to the fastest available server in that location. The final tab (on the left of the navigation pane) is Purposes. Here you have three options — Start Streaming, Secure Downloading, and Start Unblocking — similar to those found in the desktop client. Finally, you have the app Settings accessible by clicking the gear icon in the top left-hand corner of the main screen. 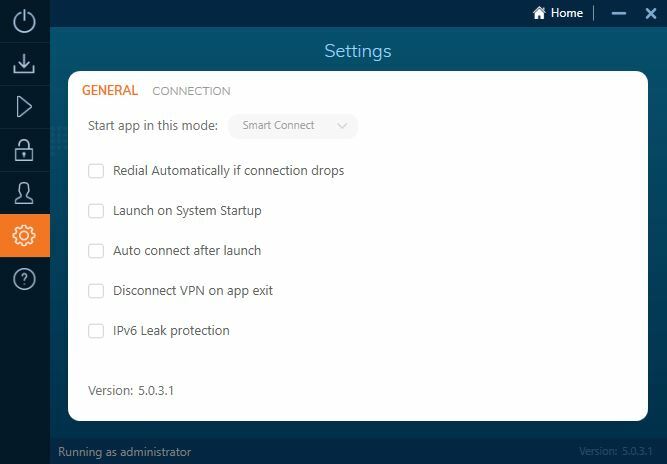 Here, you can change your protocol and set up the On Demand VPN and Manual Dialing features. 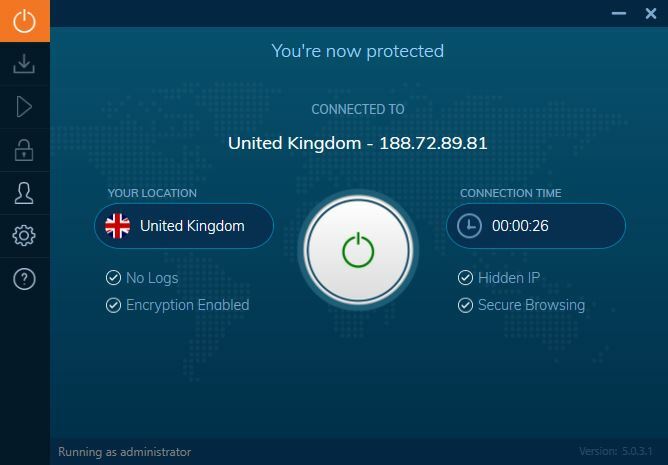 On Demand VPN enables you to create a list of websites you’d like the VPN to automatically protect. Every time you visit one of these sites, the VPN will connect before you land on the page. Manual Dialing is a static IP address feature for users who would like to have the same IP address at all times. This is useful for sites like Steam or banking websites that prefer you log in from the same computer. Ivacy offers a modest, but not tiny, network of servers with more than 450 in over 50 countries. You can select your server based on country or city, or you can use the special tabs to choose one for a specific use case such as downloading or streaming. We tested several servers and the overall performance we experienced was excellent. You might expect otherwise from a lower-cost provider, but Ivacy did not disappoint. We were able to play online games using test servers in the US and the UK with no issues. We used the same servers to stream 1080p with no buffering. The general time to connect to a server was fast and there was no noticeable slowdown with respect to general browsing with any of the servers we tried. We did often get an error message when trying to connect to a Los Angeles server. It worked at times but not at others. Not all servers were tested so this could be a one-off or an ongoing issue. When performing speed tests, we aim to be as empirical as possible. For each test, we downloaded the same single file (~100MB) from a server located in Oregon. The tests were run at three different times of day, alongside two other providers, NordVPN and StrongVPN. We conducted the tests in Toronto, Canada, and for each provider, we ran tests using sample servers in the US East, US West, and the UK. In addition to testing the VPN servers, we ran control tests at each point in time without the use of a VPN. In the boxplots below, the median download time is where the two blue boxes meet. Lower is better. The overall box size is an indicator of the spread in results. Smaller is better. As you can see, Ivacy fared very well in the tests. When connected to a geographically close server in the US East, the speeds were only 15-25% slower than those recorded without the use of a VPN. Even for a geographically distant server in the US West, we saw some speeds which weren’t too far off those of the control. As expected, the UK server was quite a bit slower, with speeds near to half those of the control. But it isn’t uncommon to see these sorts of slowdowns and more, even with top providers. For such an inexpensive provider, these are surprisingly pleasing results. It’s important to point out that these tests aren’t definitive and simply serve as a general indication of the performance you may see. The inherent volatility of the internet adds a significant factor of randomness, so these tests should be taken with a grain of salt. They were run while using a 70Mbps connection, so you’ll likely see longer wait times with a slower connection, and perhaps smaller or larger discrepancies. Does Ivacy VPN unblock Netflix? First, we tried connecting to several US servers to access Netflix with no luck. Then we contacted live customer support and within minutes we were able to unblock the service. With Netflix cracking down on the use of VPNs to access its libraries, it’s becoming more and more difficult for providers to keep up. As such, it’s commonplace to have to ask customer support for specific servers, as the ones publicly listed have often already been blocked. It was a similar situation for the mobile app. US Netflix didn’t work with the general US server option or the special streaming feature available within the app. But a live chat agent gave us a selection of three servers to enter and the first one worked to unblock Netflix. Ivacy can now unblock Hulu and Amazon Prime Video as of a recent update, both in a desktop browser and in their respective apps. We’ve had mixed results with BBC iPlayer. If you do find yourself contacting a customer service agent for help with streaming, they’ll likely provide you a server address which suits your needs. In the desktop client, simply head to Settings>Connection and enter the server address in the Manual Server spot. In the mobile app, you have to go to Settings>Manual Dialing. Does Ivacy VPN’s Kodi addon work? Ivacy is one of very few VPNs with a dedicated Kodi addon. Most VPNs have to be started outside of Kodi, whereas Ivacy’s addon enables you to connect and disconnect from within Kodi itself. However, it’s currently only available for OpenELEC systems. The addon itself is fairly straightforward to use. Simply enter your login credentials and select a location from within the settings menu. However, you can’t choose a specific server and are automatically assigned a suitable one in your selected region. Unfortunately, when we tested the Ivacy Kodi addon, it wasn’t capable of unblocking platforms such as BBC iPlayer, Netflix, or Hulu. In fact, it only works with smaller services like PBS Kids and Tubi TV. Still, it’s an impressive addon and with continued development, could represent a change in the way Kodi users stay protected. Does Ivacy VPN work in China? With China’s Great Firewall blocking access to many VPN websites as well as connections to VPN servers, it’s often a struggle to find one that still works. Thankfully for Ivacy customers, this is an area that the company is focusing on, and it’s able to provide access to users in China through customized servers. There is some configuration required and you may need guidance from the support team. While the VPN works in China, the website itself may be blocked, restricting your access to support. As such, it’s a good idea to make sure you know how to set up the VPN for use in China before traveling there. The tutorials are available as PDFs for simple download, although the Windows one appears to be dated as it uses an old version of the app. Ivacy is based in Singapore which is far from the reaches of EU mass government surveillance. The name “Ivacy” is a play on “privacy,” but does this provider live up to its moniker? Security comes in the form of military-grade 256-bit encryption with 2,048 bit RSA keys for authentication and perfect forward secrecy. You have a number of protocol options to choose from, including PPTP, SSTP, L2TP, OpenVPN and IKEv2. When it comes to DNS leak protection, a section on the website talks about having to activate a secure DNS add-on within the client. However, this appears to be outdated and there is no such option available. We were assured that DNS leak protection is built-in with no additional configuration required. Ivacy uses its own DNS servers. IPv6 leak protection is built in but disabled by default. You can switch this on by going to Settings>General. A built-in kill switch is also disabled by default, but you can enable it by going to Settings>Connections. This adds an additional layer of security by automatically killing the internet connection if the VPN connection is lost for whatever reason. A neat feature we mentioned earlier is the option of split tunneling. This isn’t an uncommon feature among VPN providers but it definitely isn’t a standard option so may win over some users. With split tunneling, you can opt for some applications to go through the VPN server and others to go through your regular connection. This is ideal if you want to access both foreign and local web services at the same time. In this case, you could direct traffic from one browser through the VPN and another not. It also enables you to mitigate potential slowdowns for certain apps. If you run into any issues or need help with setting things up, Ivacy offers several options for customer support. The searchable support pages cover getting started, troubleshooting common technical issues, and general FAQs. If you can’t find what you’re looking for, you can use the 24/7 live chat to get a prompt answer. As mentioned, a live chat agent walked us through connecting to Netflix with professionalism and expert knowledge. The response to more technical security questions was a little less knowledgeable. In case a live agent can’t help you out, you could submit a ticket through the contact form. Because the live chat is outsourced, submitting a ticket might be a preferable option for more privacy-conscious users anyway. Alternatively, you could connect with Ivacy through Facebook or Twitter, where the company appears to be fairly active. With its low prices and relatively small network of servers, you might not expect a lot from Ivacy. However, this provider performed well on all fronts. It offers decent speeds and access to blocked content such as that from Netflix and BBC iPlayer. It gives users unlimited bandwidth to play with, as well as P2P optimized servers, so torrenters won’t be disappointed either. What’s more, security and privacy are comparable to many top providers. Customer support is generally reliable and knowledgeable, although you may have to contact the company directly with more technical questions. We did run into an issue with connectivity on one server, but for the most part, the service was very reliable.